You must be here from the talented Melissa Bickford's blog. Today we are celebrating Pinkfresh Studio's 4th birthday! I have only recently joined this whimsical company and I have been having a blast! I have a fun, floral card to share today. For my card today I have used Fleur 1 and Word Series: Brilliant Stamp Sets. I coloured the stamped images with Artist Markers and then die cut these with the coordinating dies. I added a light green colour wash on my background and then added black splatters. Next, I popped up all the elements on different levels with foam tape. In the end, I added sequins and confetti for bling. Each stop on the hop will have a winner and all winners will be announced on the Pinkfresh Studio blog on Monday, April 9th 12:30PM PST. Commenting closes same day at 6AM PST. - I am giving away $40 to the Pinkfresh Store. 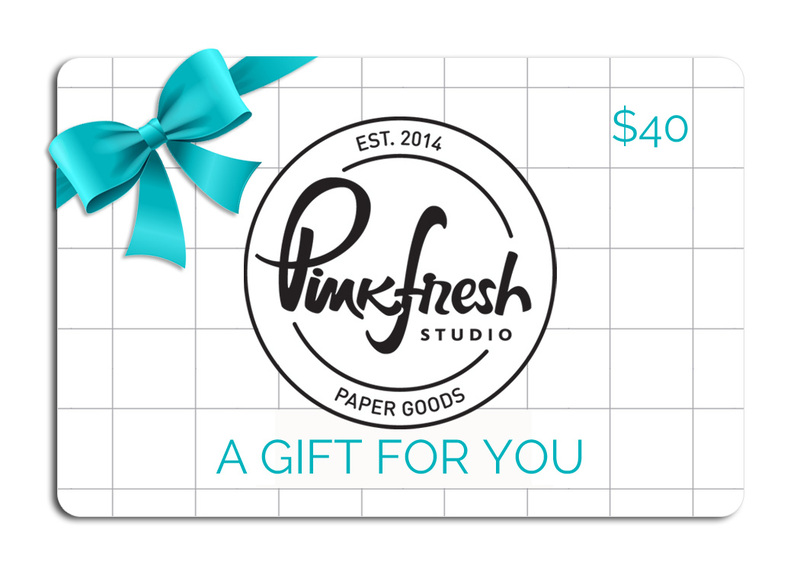 - $100 gift certificate to the Pinkfresh Store for comments left on the Pinkfresh blog. - Instagram 24 Hour Stories Giveaway: We will give one lucky winner a $100 Gift Card to the Pinkfresh Store. All they have to do is repost our Birthday Bash story. A winner will be selected within 24 hours. - Another giveaway on Pinkfresh Instagram feed! gorgeous! Your work is always stunning! What a beautiful card! fantastic colouring as uaual! This is a lovely card with lots of sparkle and dimension. Great color choices. Brilliant says it all. What a stunningly beautiful card. Thank you. Brilliant is what this card is. I really like this card. Thank you. Wow! Your card is absolutely beautiful!! Wow I love everything about this card. From the colors of the flowers, to the spattering, to the wash of color on the background... and the sentiment! Great card! Beautiful use of color here. Loving the background as well. Ooh MY! this is just to pretty, I love the stamp set and color choice ..
Beautiful as usual. The flowers are spectacular but that background is what really sets them off!! Your card is fabulous! The colors are so very lovely and you did an awesome job on it. Thanks for sharing and have a wonderful week. Beautful card, the red is so vibrant. I have recently started using watercolor in my card making so your wash of color was a special treat. Thank for sharing and for a chance to win in this hop. Your card is beautiful ! I love the red you've selected, it's perfect for a bright color. Very pretty card. I love the red flowers! I think this card is not only 'brilliant' but also quite stunning. Always love your pretty works of art. Beautiful! The soft watercoloring in the background adds so much. Ah, your card is "brilliant." I especially liked the background wash to set off the flowers. 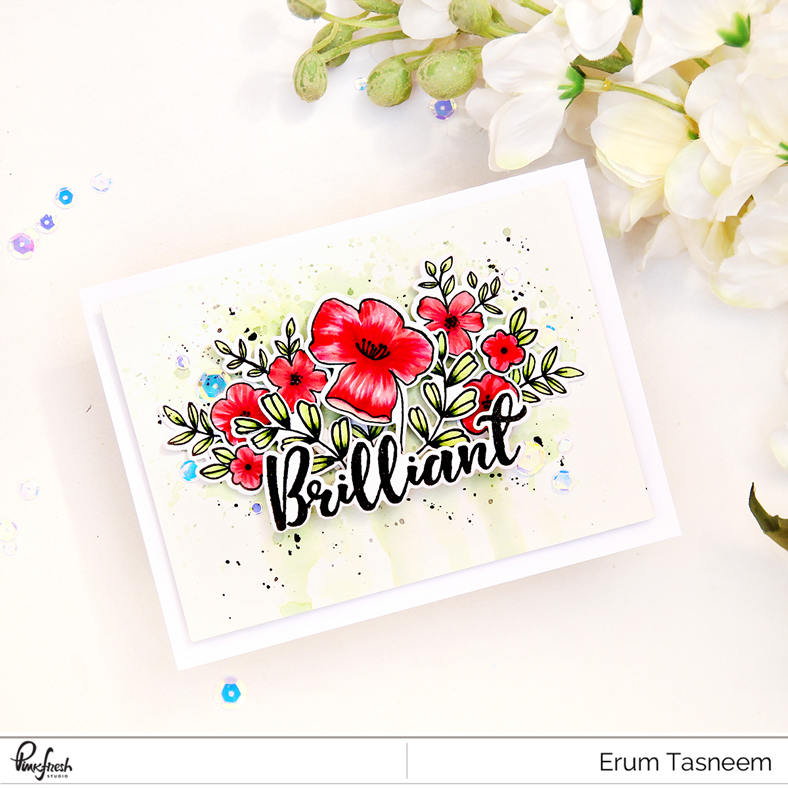 Erum this card is so vibrant, love it! I have the Fleur stamp but now I have to get that word set so I can exactly duplicate your card, lol! Beautiful as always. Loved the light green watercolor wash in the background. Thanks for sharing. Beautiful. I love all the dimension. This is my favorite so far. Love love love love this card! Gorgeous card, background and all! Love the bright blooms! The color palette draws the eye to the Brilliant red color! So pretty! Beautiful card. Your coloring is amazing. Love the stunning red color and the layered design--gorgeous!! Thes are brilliant card.your coloring , and your background are amazing. Wow I love how this pops with that color. Beautiful! Wow!. Stunning "spring" card. I love this creation. Thanks for sharing. 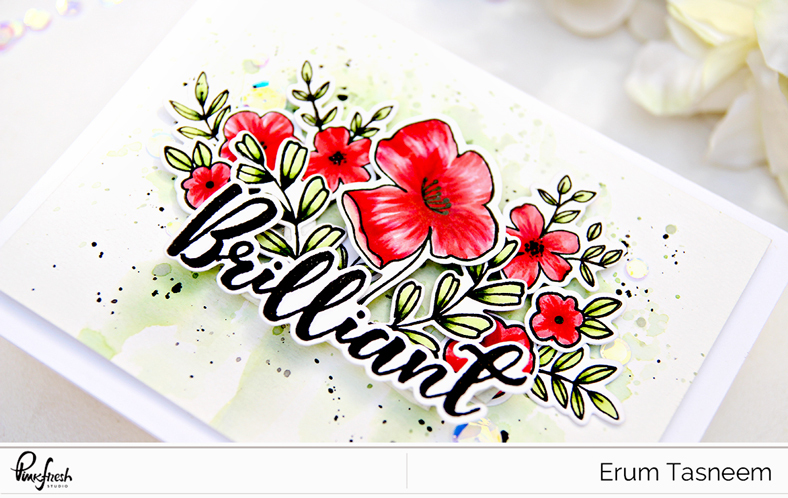 Beautiful floral bouquet and awesome coloring on your pretty card! Oh my, brilliant is right - what a brilliant card. Simply stunning. I adore your card! Love the color of the flowers, the background and the overlapping too! Thanks for the chance to win and happy b.day PFS! Beautiful card! I love the pop if color and the dimension. Such a pretty card would brighten anyones day!! These flowers are so beautiful! I'm enjoying this hop. Stunning card! That red is fabulous! Love the bold color of these beautiful flowers! Your card is just "Brilliant" and lovely. Love the splatter details and the bright color. Such a pretty card - love the crisp clean look and the vivid colors. I always love your work Erum (or should I say ET?). You have a great instinct for composition! Love it! Erum this is so beautiful, your work is always amazing! TFS! This is sooooo pretty! I love the subtle background and your color choices. Your flowers are so gorgeous but the background is just perfection for setting them off! Erum, your card is gorgeous! I love how you colored the floral bouquet! I love the background wash...it makes the flowers really pop! 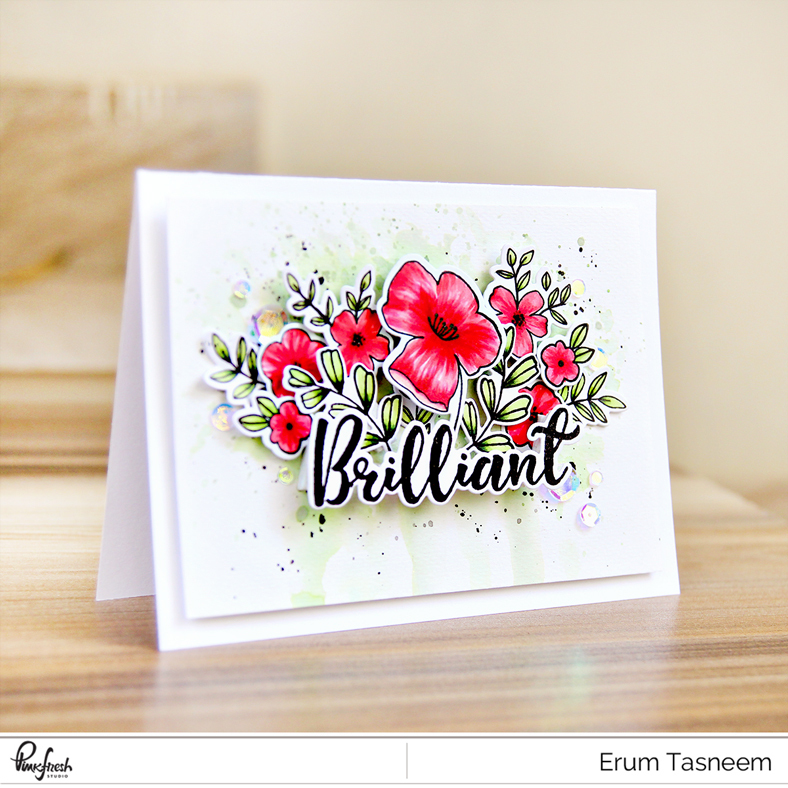 Hi Erum, GORGEOUS card, I always LOVE your work. Such a beautiful card, pretty coloring also. I really love this company so I am thrilled to hear you are working with them now, that is so exciting. Also Happy 4th to them. Such a pretty card. I can not wait for Spring. Gorgeous card! The colors and composition are both quite lovely! This card is very pretty. The red just pops. I love these vibrant flowers against that beautiful, soft background. Beautiful card. Love the pop of red and the black. I'm going to use this for inspiration. Love it! Your card is beautiful. I love the color~so cheery! I love the different levels for the elements on your cards ! And the background is very pretty, too. TFS. I love your card, the color is beautiful and so cheerful! Lovely floral card! Love your beautiful coloring! Hermosas su tarjeta, me encanta como quedaron los colores escogidos por usted simplemente hermoso!! Stunning florals! Arranging them on different levels adds so much interest to overall design , loved it ! You make the most beautiful cards. I have never seen one that I didn’t love. Thank you for sharing your talent with all of us. This is such a gorgeous card! I love how the floral piece and sentiment pop against the light washed background! Wow - how very pretty! So happy to see this hop for a great cause! So pretty. I love it. 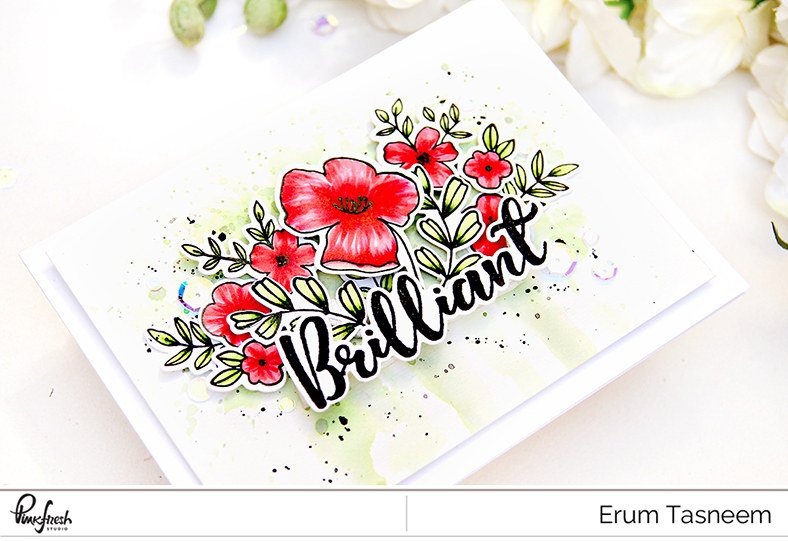 Beautiful card Erum! Those flowers are so bright and beautiful! Thanks for sharing! Oh my gosh, this is stunning! Such a pretty card with nice dimension. Erum, your talent is such a delight! This beautiful floral is stunning with each detail layered together to orchestrate the beauty of the whole! The sequins and confetti with the lovely coloring and soft hues in the background are come together to make the actual image shine through! So simple yet so much time to bring it to this level of gorgeousness!! I just love your work! So pretty! Love watercolor drip background! Thanks for sharing!!!! I normally not a fan of elements that take up a whole page but I really like how this was done. I think it's between the bold red and the layering of the flowers giving them that separation from the background. This card is so beautiful! Wow! Love your gorgeous card!!! Colors are amazing!!! You made this stamp set look so pretty! This card is so pretty and vibrant! Pinkfresh has such beautiful flowers, and you made them even more amazing. So pretty. I like the your coloring. The flowers are looking awesome. Beautiful card, Erum! Love the background you created for the flowers! I know I have told you this already, but WOW, Erum!! gorgeous card!! Just lovely! Your coloring is stunning and I love the watercoloring on the background! It amazes me what spattering adds to cards! Fleur 1 - what a beautiful stamp! Going to have to check this one out on PinkFresh. I really like how you did the background; it meshes so well with the stamp that you would almost think that it was a stamp itself. I love cohesive backgrounds and designs like this. Thanks for sharing such a beautiful card! Wow!! Stunning card!! Your coloring is amazing!! I think of all the flower dies I’ve seen so far, Fleur 1 is my favorite by far! I love how you created eye catching pops of flowers and colors and blings all together. It’s fantastic and I want to make your inspiration card too. What a beautiful card! Love that Fleu 1 stamp! Wonderful! Very pretty flowers and I like the soft background. What a stunning card. 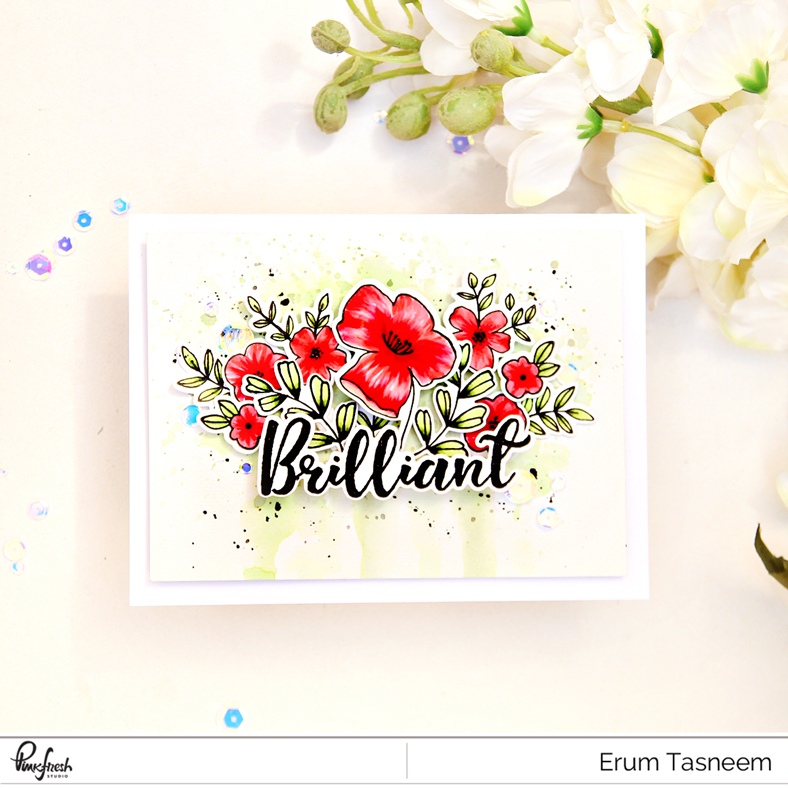 I love this stamp set and the “Brilliant “ word. I love discovering new and beautiful products on these blog hops. Thanks for sharing. Brilliant card. Love these colours. 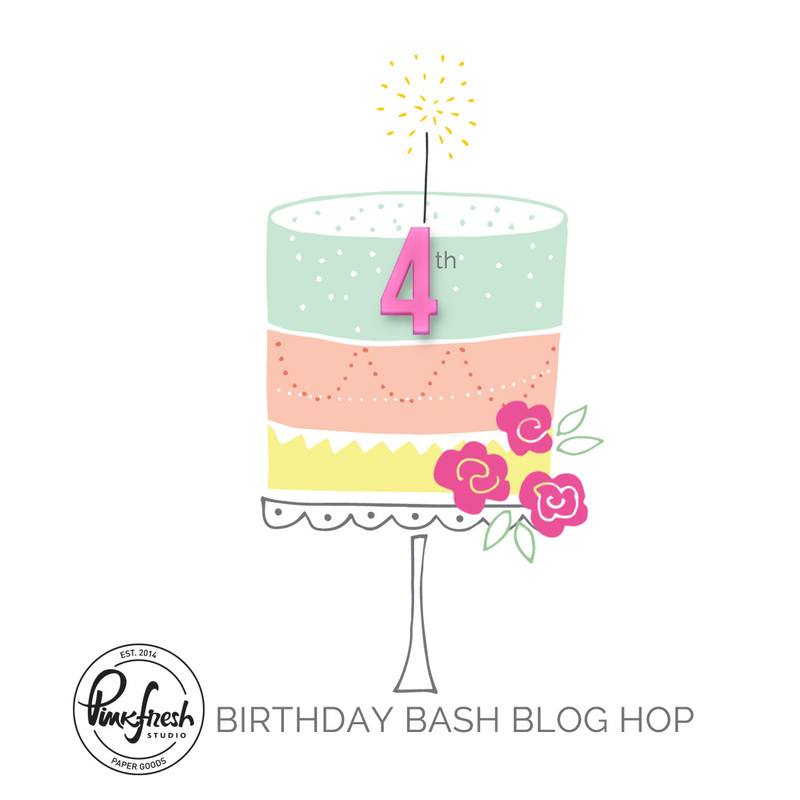 Congrats to Pinkfresh on their 4th anniversary! Wow wow wow! What a job! I literally love this card! What a gorgeous floral card !! Oh this is gorgeous...and your coloring is just magnificent! !